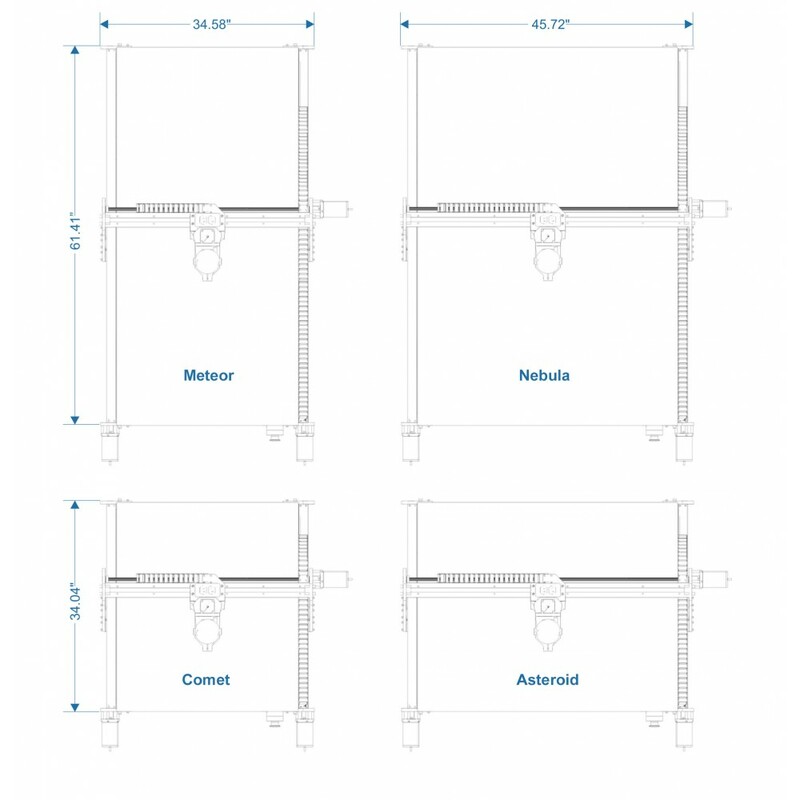 The Galaxy Series machines must ship by freight carrier. If you are in the continental USA, the shopping cart will calculate freight shipping automatically. For outside of the USA, shipping is FOB Origin (with a $120 crating fee) and the buyer is responsible for arranging pick-up with a freight courier. The freight is one palletized crate, class 92.5 from zip code 32548 USA. See the grid below for weights and dimensions. Email support@probotix.com or call us at 844.472.9262 between 7AM and 4PM Central Monday - Friday if you need further assistance. 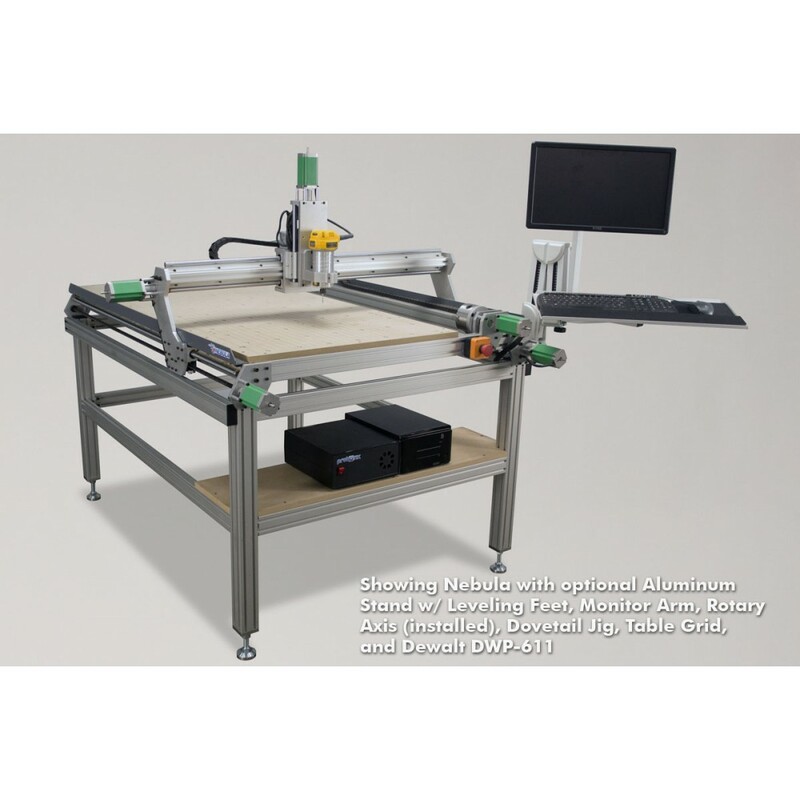 With a whopping 37" x 50" work envelope, the GX3750 Nebula is our biggest CNC machine yet! This is a high performance, general purpose machine tool positioner, suitable for many uses such as guitar building, clock making, plaques, signs, RC aircraft parts and more! New GX series models include a high-rigidity HD gantry with taller uprights for increased clearance. 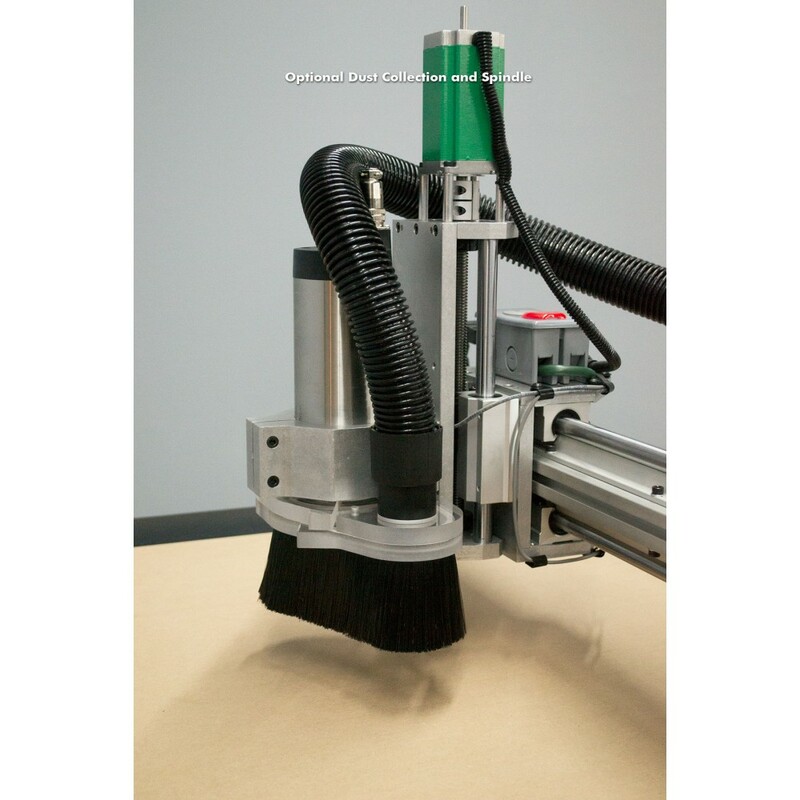 This machine comes fully assembled and is shipped in a crate handled by a freight carrier. 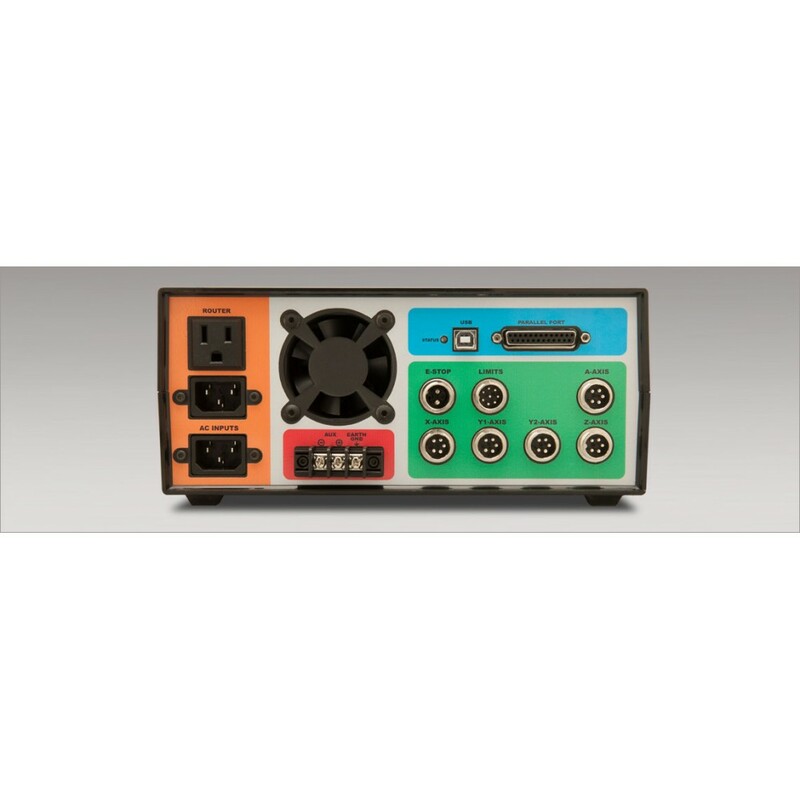 With pre-installed home/limit switches, spindle control relay, cable chain, and carriage mounted spindle power jack, no other machine on the market comes close to being this complete, and ready-to-run. Large enough to make guitar bodies, our #1 most requested feature. This machine is at the very edge of what you can do with an ACME screw mounted in this way, where it will not whip at high speeds. 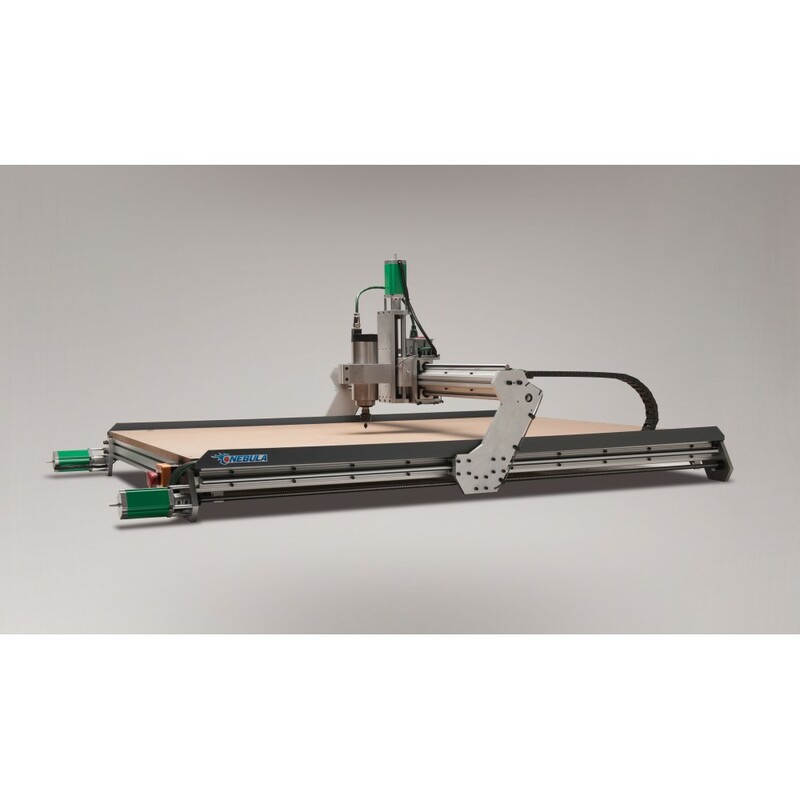 By using this mounting method and not using ballscrews nor rack-n-pinion, we are able to produce this machine with ZERO lathe work. 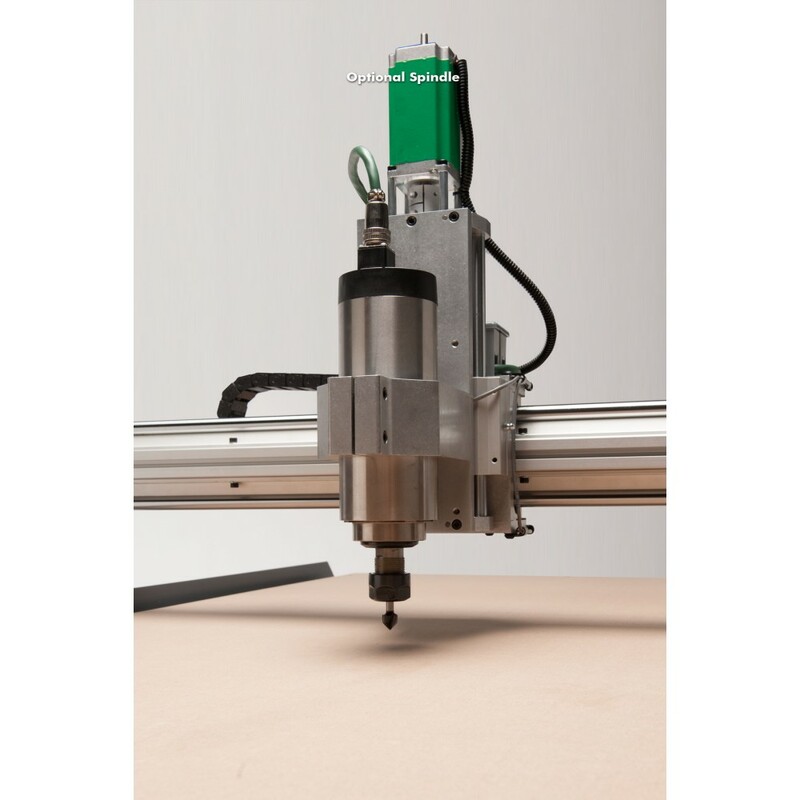 The machine was designed such that every part of it could be manufactured in-house within the work envelope of our milling machines. By having zero lathe work and in-house milling, we don't have to deal with the outsourcing to expensive machine shops. Less flex. Supported round rails offer the same benefit as the hiwin type of rails, at a fraction of the cost. More affordable than ballscrews, yet capable of precise positioning and rapid travels. Zero backlash. Delrin anti-backlash nuts apply pressure to both sides of the screw face eliminating backlash. The anti-backlash nuts by design will wear out, but are user replaceable. Less time flying through the air to get from one entry point to the next. Any faster than this and you'd have to set the acceleration so low that it'd never reach that speed anyhow due to the mass of the gantry and carriage. More rigidity. Very minimal tool deflection. The tandem motor setup, coupled with some LinuxCNC sorcery makes squaring the machine a breeze. The independent but simultaneous left and right homing sequence will re-square itself every time the machine is homed. Tandem motors also prevent racking, which can be a problem when the tool is operating at the edges of the work envelope. 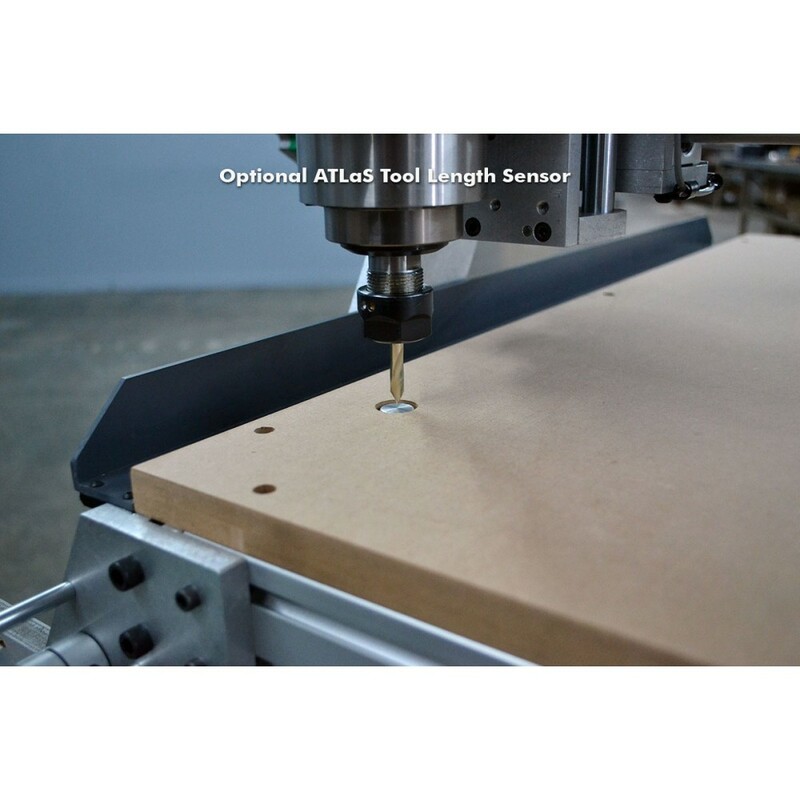 Removing the leadscrew from the center of the table eliminates work piece height limitations. 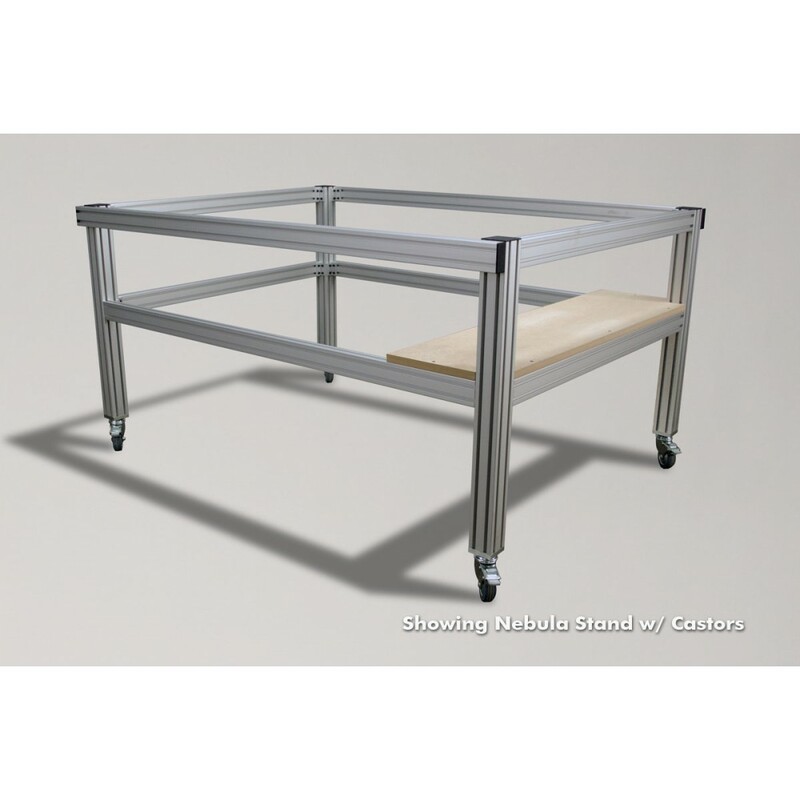 The open frame design allows for taller work pieces and many fixturing options. The spoil board can be mounted above or below the frame. 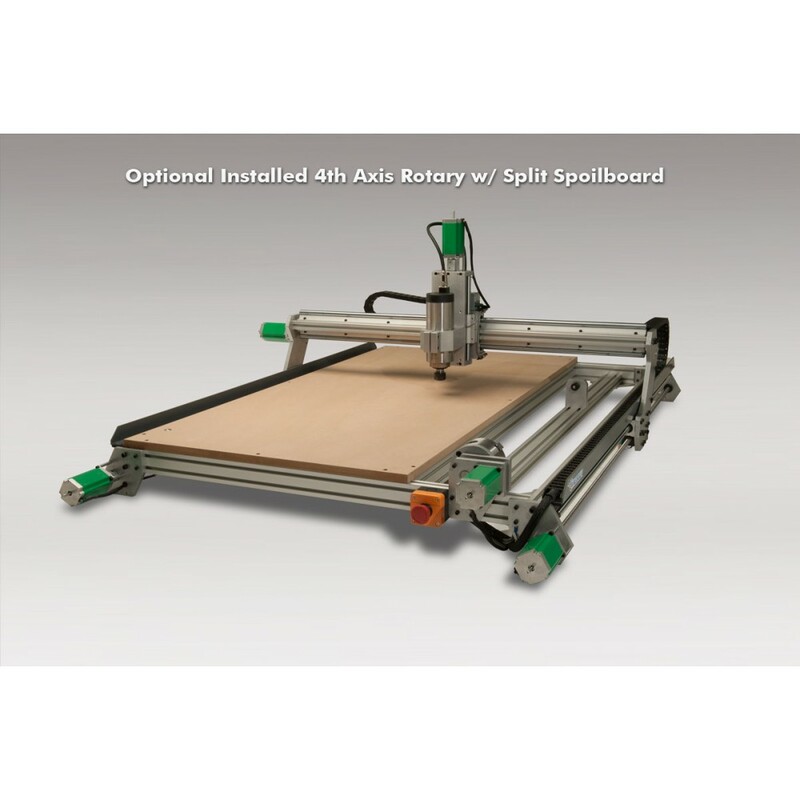 Also, the spoil board could be completely removed, and the user can fabricate any sort of mounting system, rotary table, etc. The use of T-Slot on the frame makes fabricating your custom fixtures and mounting them a breeze. Because of the tandem motor setup, homing switches are essential, and thus are factory installed. No other machine in this class comes with pre-installed homing/limit switches. 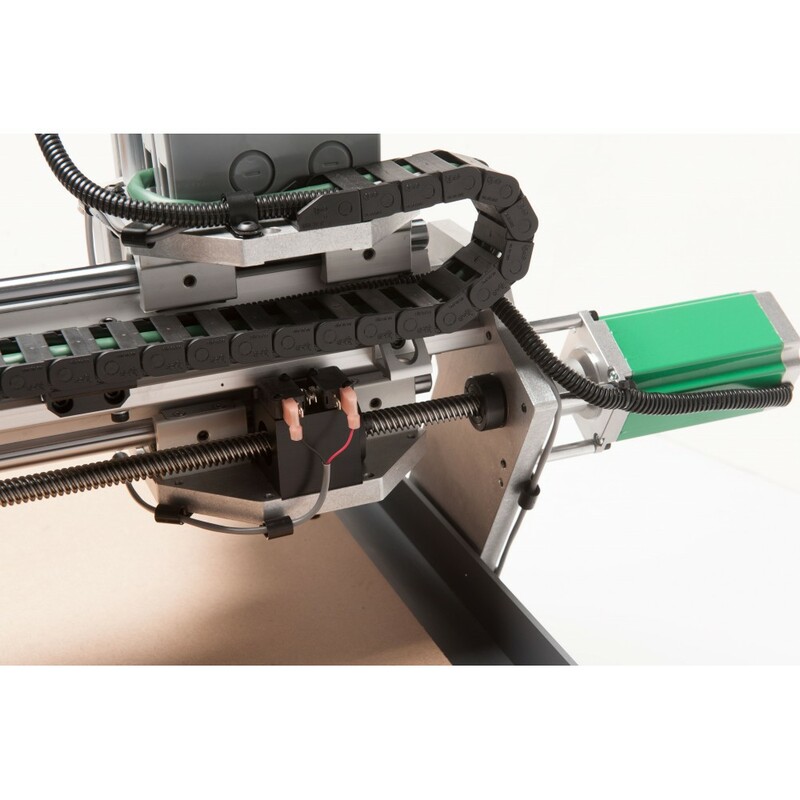 Clean and professional IGUS cable chains guide and protect the wiring. Another exclusive feature that you will not find on any other machine on the market. 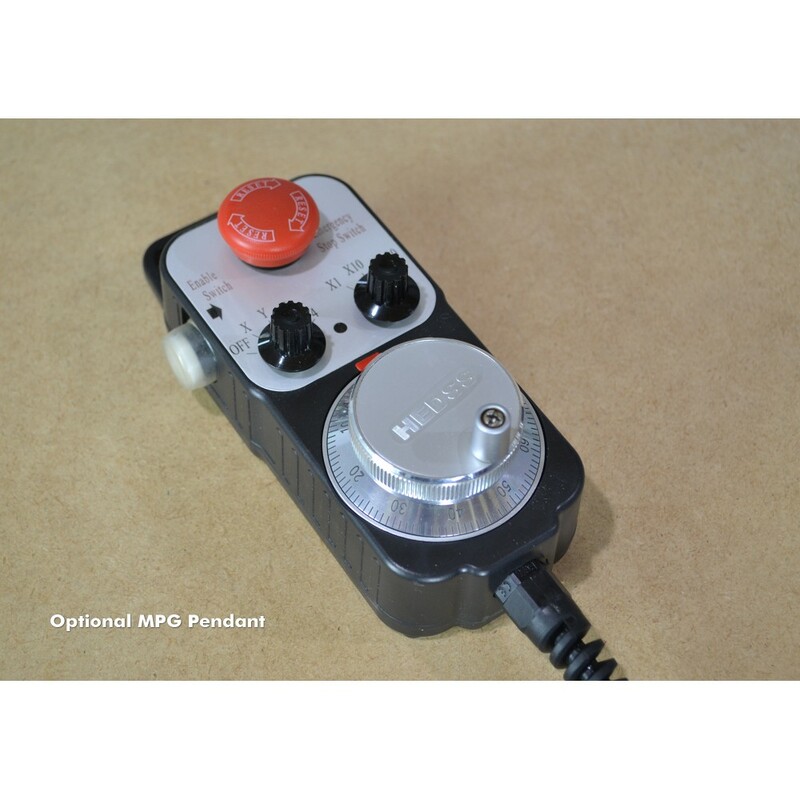 Even includes frame mounted emergency stop switch. Nope - the other guys don't have this either. 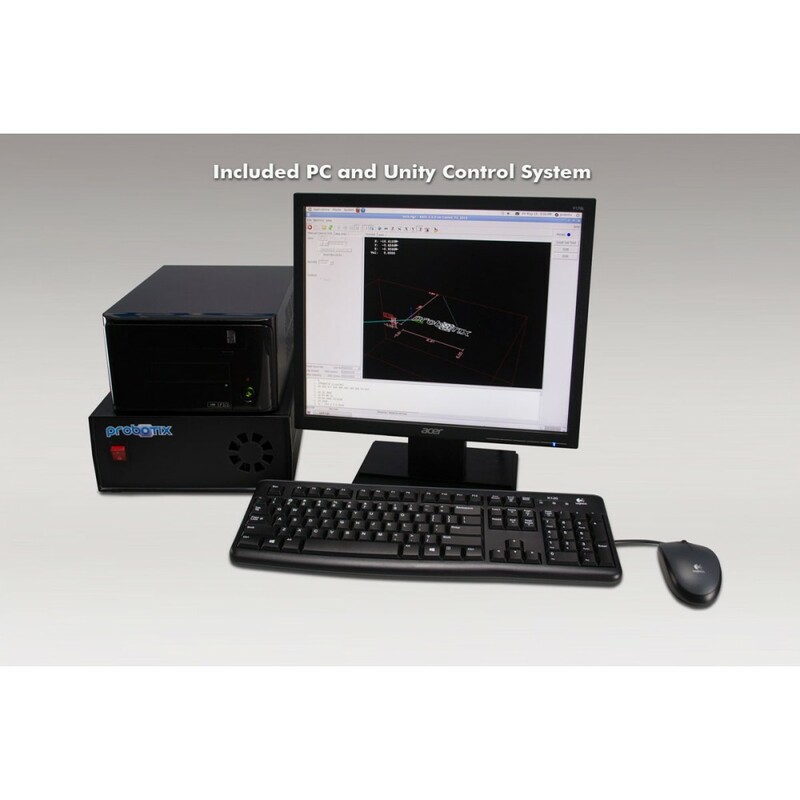 This machine was designed around our MondoStep Stepper Motor Driver kit with 420ozin Motors and 40V power supply. No other motor driver kit will run this machine as it was intended. 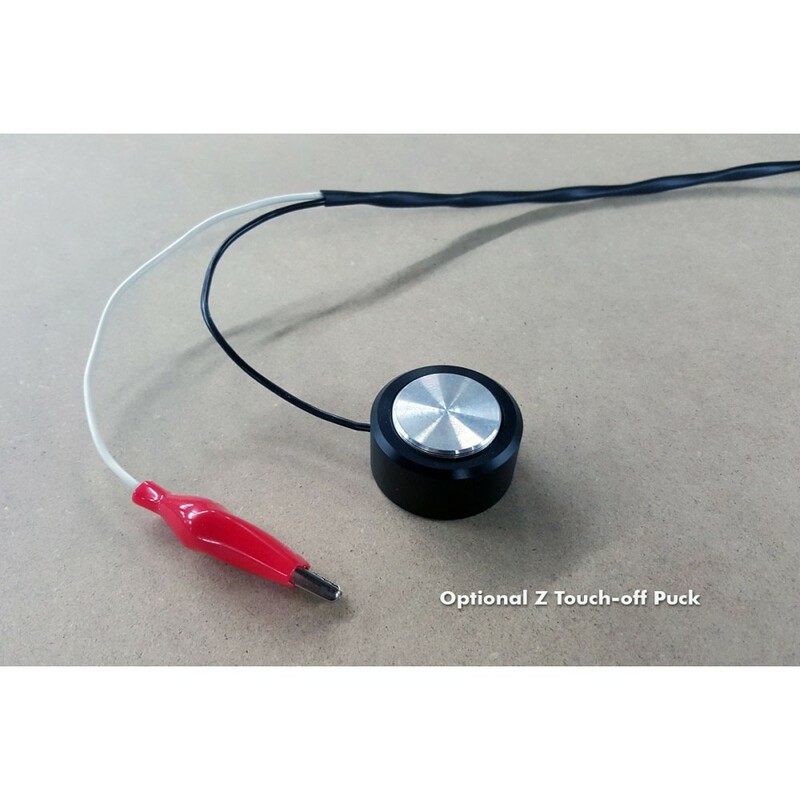 The motor/driver kit comes as ready-to-run, with enclosure, fan, connectors, and all. All you have to do is connect the motor and switch jacks, attach it to the PC, and power it on. 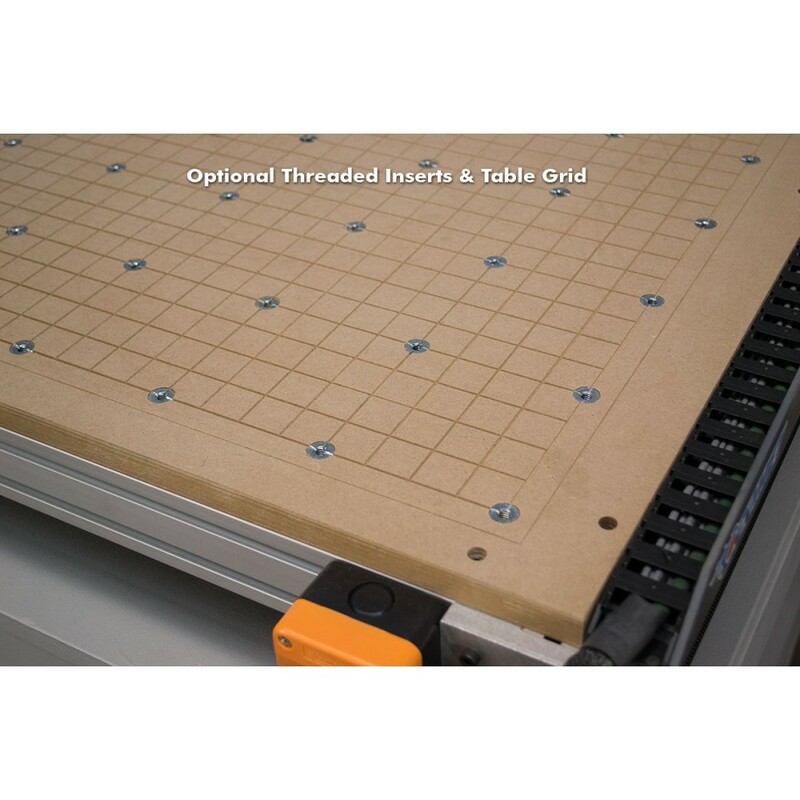 Because of the tandem motor setup and the custom configuration necessary for LinuxCNC to coordinate the homing sequence, we feel it is best for us to include a pre-configured PC. Also, it needs to be a modern PC to spit out the step pulses fast enough to achieve our high speeds. Relay router control is standard on this machine. There is a 110V power jack mounted to the carriage. This allows us to run the router power through the cable chain. 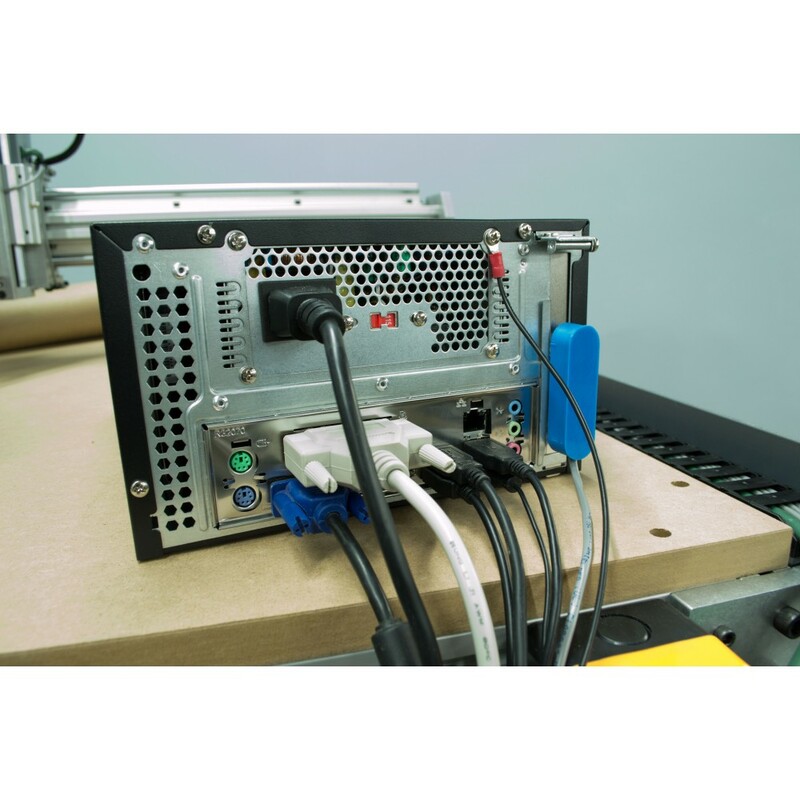 The user can easily change out routers as needed, and will not have to cut off the plug on the power cord - which would void the warranty on your machine. If you choose the 80mm spindle option, we will also install a speed control interface for controlling the speed of the spindle in software. The bolt pattern is the same as the V90, and any of our spindle mounts will work on this machine. An array of this bolt pattern on the z-axis face allows you to mount the spindle in several positions relative to the z-axis travel. This will help with different tool length requirements, and fixturing offsets.